This work comes from the period when Marcel Broodthaers, after years dedicated to poetry, turned his hand to the plastic arts. In this new environment, he looked at the status of artworks as merchandise. Tableau et tabouret avec œufs (Painting and Stool with Eggs) anticipates the theories on artistic production that the Belgian artist focused on from 1968 onwards, dealing with concepts like the temporality of artworks and their ephemerality, while highlighting the processual side and expanding the traditional visual lexicon by including elements taken from the everyday. On the other hand, he also brings certain Dada and Surrealist concepts back into play, such as randomness, chance and accident, introducing new elements to the demystification process of the artist figure that was taking place in European art at the time. According to the artist Raphael Opstaele’s account of the work’s beginnings, it was created using various elements from reality (boxes of eggs – which have since disappeared – and a stool) while it fell apart through the effects of passing time and its own inherent fragility. 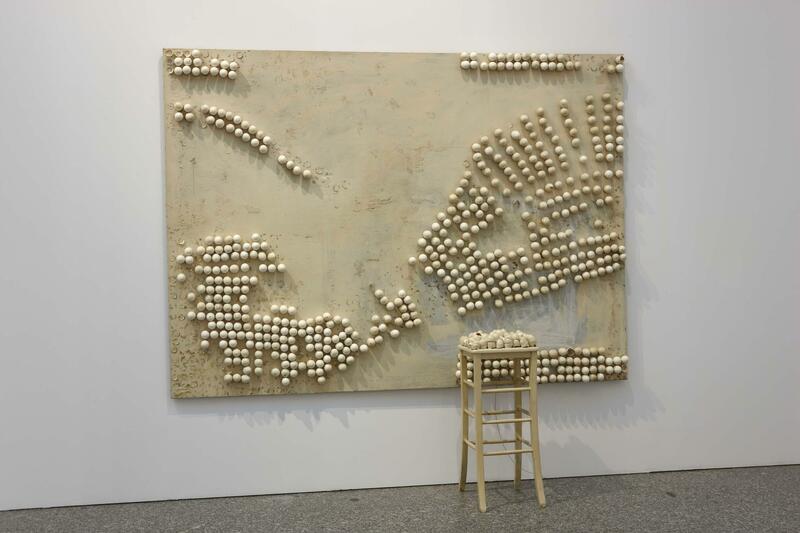 By responding equally to both the traditional creative process and the permanence and stability of the piece, Broodthaers demonumentalised the work and put the role of the spaces where it was to be shown and the people responsible for its safekeeping to the test. His artistic discourse is connected to the argument that cultural institutions must always be aware of the conflicts and situations emerging in the real world.